In Jacksonville, Florida, you will probably find a lot of different moving companies. When you are choosing Jacksonville movers to help you with your moving needs, some things need to be considered. Quickness, affordability, and qualifications are three things that need to be taken into consideration. The moving company that can provide you the best of each is Top Notch Movers. At Top Notch Movers, we offer all services that a moving company can offer including the packaging and moving of all of your personal items. There is never a problem for us coming to your home, packing up all of your belongings, and moving those belongings to your desired location. As movers in Jacksonville, we strongly urge you to create a checklist of your possessions that need moving before you call any moving company. When you finally call the Jacksonville movers, you should be able to give them this list so the moving company knows the things that you will be moving and will be able to give you an accurate estimate. There are moving companies out there that will not give you an estimate over the phone; these are companies that you need to look out for. These moving companies will tell you that they need to begin the job before they give you the final price, giving them the chance to blindside you. The moving company that you choose should be able to give you an estimate over the phone. 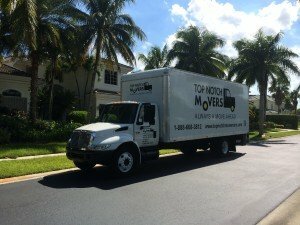 Top Notch Movers is a company that will provide you with an estimate before we start working. After you receive your free estimate from Top Notch Movers over the phone, we will send to you an employee that will give you an accurate quote. Jacksonville Movers that are qualified should not have a problem doing any of this. A company that does not want to give you a quote will usually try to pile up additional fees on top of their work. Some of these fees can include service, boxing, and labor charges. When dealing with moving companies be careful, always make sure that you have a written quote from your movers before they begin their work. Commercial – Businesses and business owners both know the dangers of being closed for a day. It can result in backups, shortages , and disgruntled employees. Don’t let this happen to your business when you’re changing offices, call us today! Residential – If you’re an everyday normal guy, you know how difficult it can be to go through and scrub, mop, sweep, clean, and vaccinate the entire area that you lived in. Why do you want to tack on moving, packaing, and lifting tro that list, take it easy! Senior – Senior Citizens receive a 10% discount on all of our moving services. This is a great opportunity for many senior citizens who might be unfit to move anything by themselves! Veterans – Veterans, like seniors, receive a 10% discount on all of our moving services. If you have previously served our country we want to give back to you by doing the best we can to make your move easy and successful. 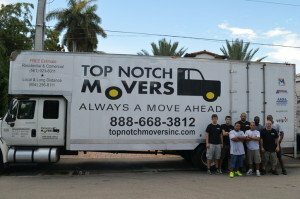 As movers in Jacksonville, Top Notch Movers always has your back. We are always offering our clients the best customer service available that is unmatched by most others. Our goal is your complete satisfaction, and if you are not satisfied with us, then we have not done our job. Call us today. Why should you Hire a Moving Company in Jacksonville? A Moving Company might be an on-the-fence decision for many of you, but that can’t be a worse decision. Hiring a moving company will save you time and potentially a ton of money if you hurt yourself moving. Save Time – First, it saves you time. Most people spend an average of 6-12 hour just doing the packing, heavy lifting, and driving and that’s only for small, local moves. For those who are going state to state, you might as well double that time! Don’t Put Yourself in Danger – Heavy Lifting is a dangerous process for your lower back, your spine, your arms, fingers, and toes. Don’t put yourself in danger when you don’t even have to!